Need to escape the traditional Italian cuisine for an evening but can’t bear to leave the Mediterranean? 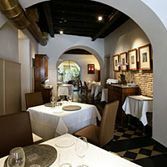 Chef Antony Genovese — French-born of Calabrian parents — tuned his cooking fork in Florence’s Enoteca Pinchiorri and earned his first Michelin star in Ravello, at the Hotel Palazzo Sasso. Now, he’s brought one to Pagliaccio, which received Michelin honors in 2007 (and with the star, up went the prices). Genovese is divinely creative without resorting to silly eccentricities. To wit, red prawns with toasted peanuts in a light sauce of coconut and green tea; saddle of lamb with lemon and wild fennel; eggplant purée, and fried figs. Lovely presentations.